The following stations were heard on the ICOM R7000, using an ANLI AL-800 antenna (a ham 2m/70cm telescoping whip). If there is a callsign listed, I at least listened to it long enough to verify the call, I just felt like spinning the dial one night, the rest of the data is from the FCC database, it may or may not be correct. This map shows the location of all the stations in the log. This map zooms in on Boston. 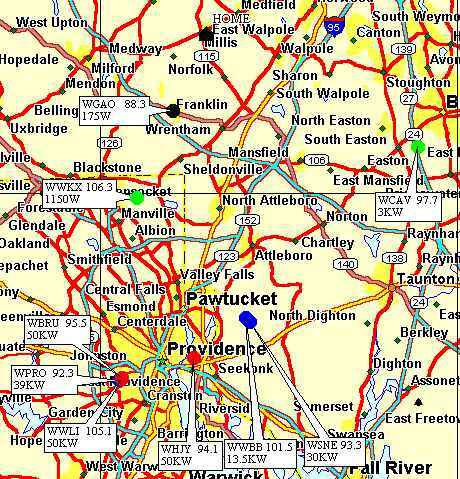 This map zooms in on Providence. Stations with signal strengths 2 and below are affected by noise. 100.1 ? ? ? ? ? ah yes....another country station bites the dust! !